The French cruise ship Le Soleal set sail from Saigon port, Ho Chi Minh City, on February 6, finishing an eight-day voyage from Hai Phong City to the southern hub for 200 passengers. It was among a series of ships carrying passengers to Vietnam in the beginning of 2014. 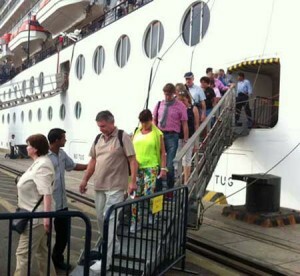 President of the Viet Excursions Co. Ltd. Phan Xuan Anh said that the five-star liner from the French operator Compagnie du Ponant will return to the Saigon port on February 10 with more than 100 tourists. Another luxury ship named L’Austral from the operator will also arrive in the country in 2015, he added. Meanwhile, Le Dinh Tuan, a representative of the Tan Hong travel company, said the firm is planning to welcome an array of well-known luxury liners such as Seabourn Legend, AIDAura, SS Voyager, Nautica, Diamond Princess and Queen Elizabeth. According to the Saigontourist Travel Service Company (STS), from January 23 to February 15, it is set to welcome more than 52,000 passengers and crew on over 20 international liners. Anh said such travellers demand high-class services. Tourists boarding Le Soleal asked for high-class cars to explore their destinations. They paid 500 USD for use of a Mercedes, BMW or Audi for four hours. Most tourists with families on the cruise spent heavily on luxury clothes, handbags, cosmetics and paintings. STS Deputy General Director Vu Duy Vu said travel firms need to provide new and diverse products for cruise travellers. Particularly, they should offer tours to coastal examples of world heritage and cultural and historical traditions. Statistics from the Vietnam National Administration of Tourism show that the country welcomed over 722,350 foreign arrivals in January, rising by 7.5 percent from December and 21 percent from the same period in 2013. In 2014, the sector aims at an additional 800,000 foreign tourists, a year-on-year increase of 10 percent, and 37.5 million domestic visitors. It received nearly 7.6 million foreigners in 2013, up 10.6 percent from a year earlier.